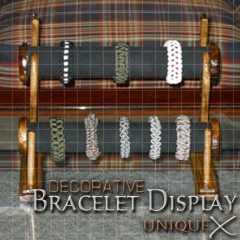 Recently while building a Paracord Tying Jig for a customer, I thought of a design idea that would be great for displaying paracord bracelets. I merged the design of a gun rack into the piece, but I tilted the curves so that the bottom rack sticks out past the top rack, it reminds me of a sword display. The materials required for building this project can be created from scrap materials that you may have lying around, which is what I did. Start by clicking on the display template located to the left, then press Ctrl + P to print the image (if your browser supports this technique, otherwise Save the image to a folder on your computer and then open it with a word publishing or image editing application to print it). NOTE: DISABLE ANY PAGE SCALING OR SHRINK OPTIONS IN YOUR PRINTER SETTINGS PRIOR TO PRINTING THE IMAGE. Mark the ½" x 6" x 24" board at 10" and cut, then repeat the step again which will leave you with two 10" pieces. 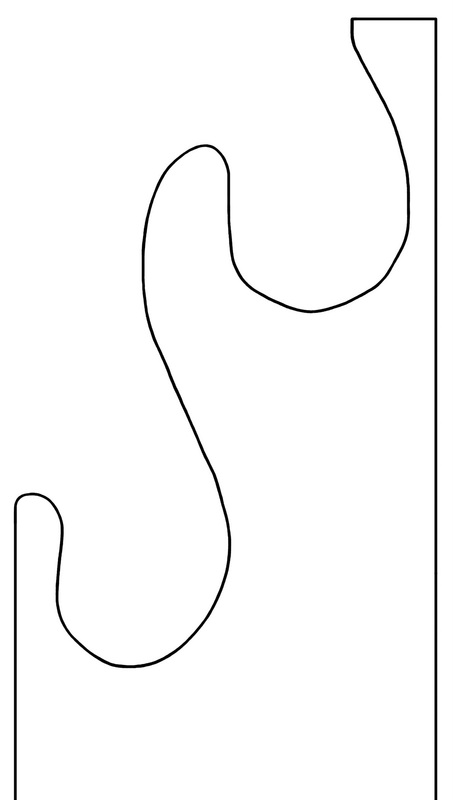 Next, cut the template along the lines and then use it to trace the image to the ½" x 6" x 24" board, do this for both pieces. 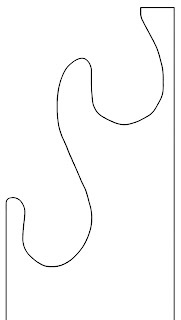 Using a Jig Saw or whatever tool you have to cut the curved pieces that you just marked. Mark the 1" x 2" x 36" board at 7½" and cut, then repeat the step again which will leave you with two 7½" pieces. Use a Belt Sander or course sand paper to round the edges of the 2½" pieces that you just cut so that it will fit inside the PVC, it should be a tight fit, don't remove too much material. Mark the 1" x 2" x 36" board at 2½" and cut, then repeat this step again until you have four 2½" pieces. Using a compass to draw a circle that is just slightly bigger than the diameter of the PVC on the ½" x 3" x 24" board (if you don't have a compass, I traced around a can of WD-40). Once your circle is traced, use your Jig Saw to cut out the circle, then repeat this step until you have four circles cut. Mark the 1½" x 24" PVC at 12" and cut, then repeat the step again which will leave you with two 12" pieces. Use a spray adhesive to secure the Spandex to both of the PVC pipes. 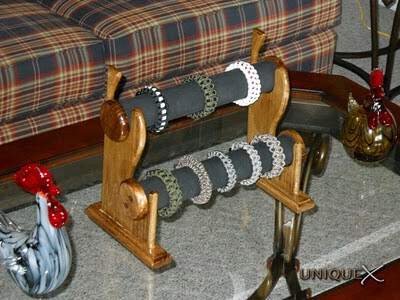 Now secure the bottom pieces to the curved pieces by using wood glue and wood screws. Finish assembling the display by securing the circles to the 2½" pieces by using wood glue and wood screws. At this point your display piece should be completely assembled. Now start sanding, be sure to start with course to medium sand paper and move down to fine sand paper once you get close to finishing sanding. Once you have smoothed all the rough edges, you will need to stain the wood. You can choose to leave the display stained or finish it with a varnish or spray (Minwax® Fast-Drying Polyurethane) for a nice shine. 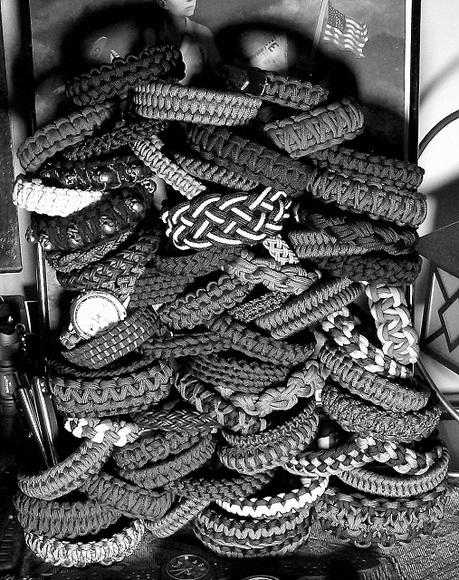 You will have to excuse the bare display rack, I recently sold or gave away most of my bracelets and this was just a few that I wear on a regular basis. Thanks SD, that sounds like what I had going on before I built this. 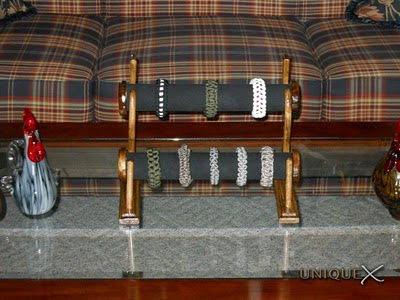 @anonymous I haven't really advertised the sale of my paracord jigs, but I have sold a few to folks who wanted them. 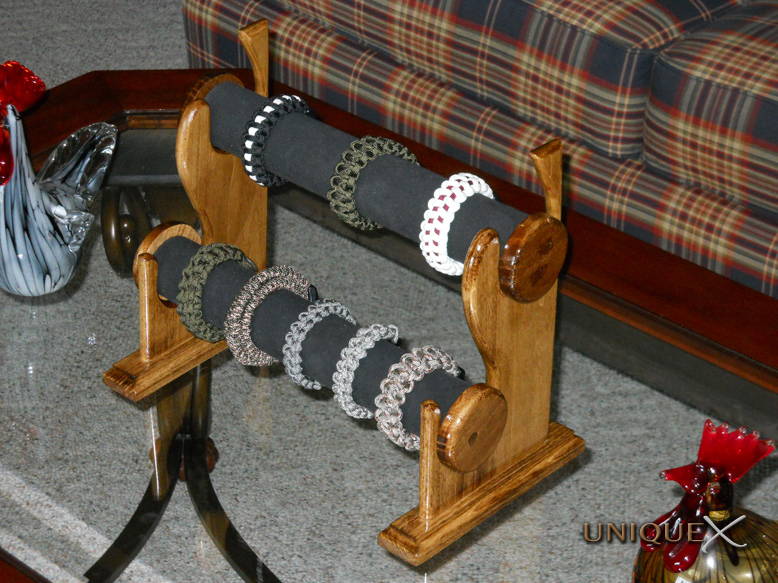 Depending on the wood used to build the jig, it can range somewhere between $50-$60 which includes shipping.